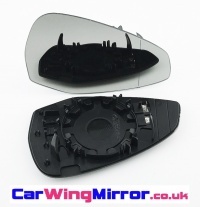 Clip In OEM style electric heated replacement wing mirror glass with integral plastic base plate for the Audi A5 MK2 [2016 onwards]. Clips into the mirror housing as original. Self adhesive replacement wing mirror glass for the Audi A5 [2016 onwards]. Sticks over the existing broken mirror glass. (not suitable for models with blind spot monitoring feature).